Kowalske Kitchen & Bath was hired by a Wauwatosa family that dreamed of a light, bright and open kitchen. The original space was closed off from the rest of the home and lacked storage and functional prep space. They also needed a casual seating area in the kitchen. The kitchen is now the focal point of this colonial home. By removing the wall between the dining room and kitchen, Kowalske Kitchen & Bath was able to make room for a peninsula with seating for the whole family. 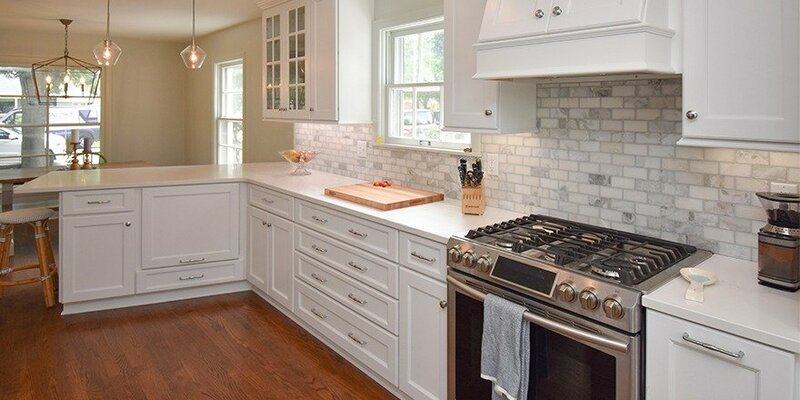 This bright kitchen features white cabinets, quartz countertops and a beautiful carrera marble subway tile backsplash. The highlight is the new sink location with a view overlooking the backyard. The sink wall has built-in appliances that disappear with paneled door fronts.